On July 25, 2018, ISIS terrorists attacked Sweida City and villages in the surrounding countryside. The ensuing massacre, one of the bloodiest of the eight-year Syrian conflict, went virtually unreported in the West. The U.S. coalition, illegally occupying Syrian territory, turned a blind eye as the ISIS terrorists that they claim to be waging war on entered the seven villages to the east of Sweida City that were targeted for wanton bloodshed. Khaled Saab’s mother, father, brother and cousin were martyred in the attack on the village of Shrehi, where 37 civilians were massacred. Khaled told me that he believed the ISIS fighters were high on drugs, very possibly Captagon. “We fired many bullets into them, but they kept fighting” he said. In January 2017 “at least 137 kg of Captagon — dubbed a ‘jihadist drug’ and ‘the drug of the Syrian conflict’” — was seized at Paris Charles de Gaulle Airport in a first for France, customs officials said, adding that “half of the illicit cargo was destined for Saudi Arabia.” Captagon is a psychostimulantthat is used as a performance enhancer by the extremist gangs that have invaded Syria since 2011. As we were eating breakfast with Ziad and his family, baby Ghala was brought into the room. 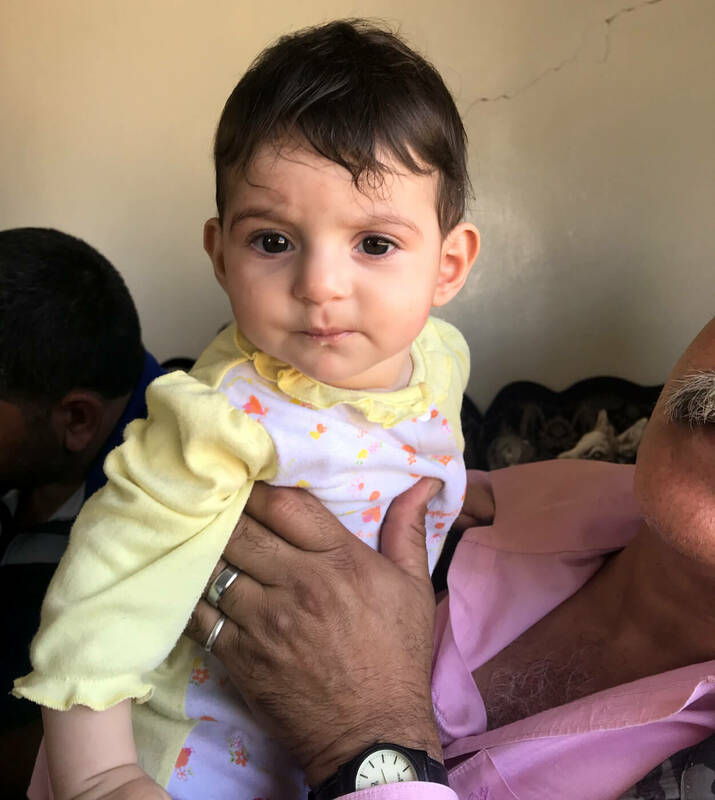 Ghala is six months old; her father was gunned down by the ISIS fighters just a hundred yards from Ziad’s bullet-strafed home on July 25. Watching Ghala being held aloft by H. Saab, her gorgeous little face breaking into smiles, it was heartbreaking to comprehend the suffering and loss that so many children in Sweida and across Syria will have to grow up with as a result of this senseless violence. Imagine that this were your village, or your neighborhood! Imagine that one of those were your house! Imagine that the same thing happened to you! Imagine that you lost a family member, or maybe two, or maybe more! Imagine that your mother, sister, daughter or son is still kidnapped and now in the hands of the worst terrorist group ever, which is ISIS! 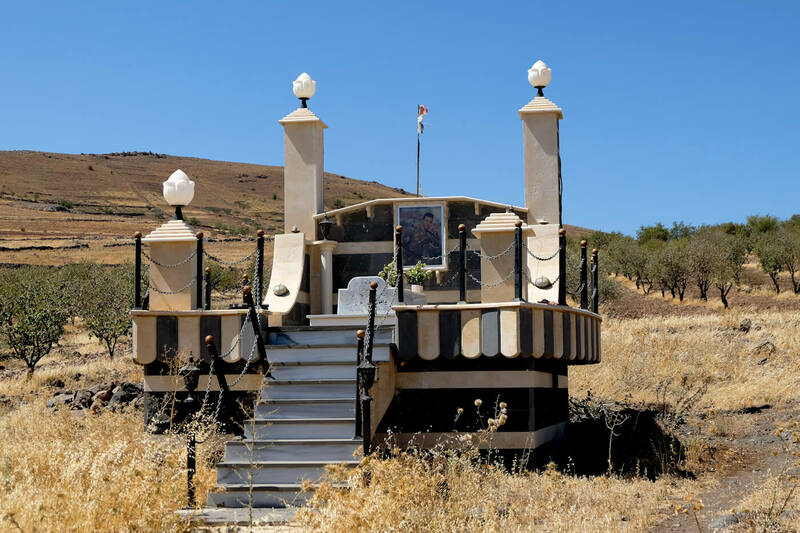 In Shbeki, the next village I visited, the violence and bloodshed had intensified. Here, 60 civilians were massacred and 29, mostly women and children, were taken hostage by the fleeing ISIS gangs. I was told, during a visit to Shbeki in November, that only 12 men were available to defend the village early on in the ISIS attack but they managed to hold ISIS at bay until reinforcements arrived shortly after. 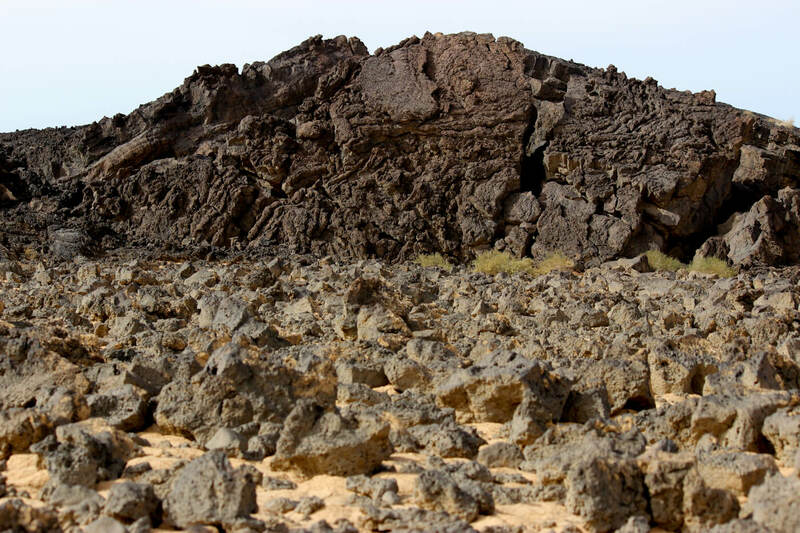 At the entrance to the village was a burned out car embedded in the rock-strewn earth. In Shbeki we spoke to Hazem, a third-year science research student at Damascus University, who had received news of the attack on his family at 4:40 a.m. on July 25, while he was staying in Sweida City. After a hazardous and circuitous journey to Shbeki, he entered the village at 5:30 a.m. in the midst of the fiercest crossfire between villagers and ISIS. All homes in Sweida have the traditional meeting room, the Madafa, which is always the most resplendent and light-filled room in any home. With the sun pouring through the glass onto the polished marble floors, I listened to Hazem as he recounted the events of that day. 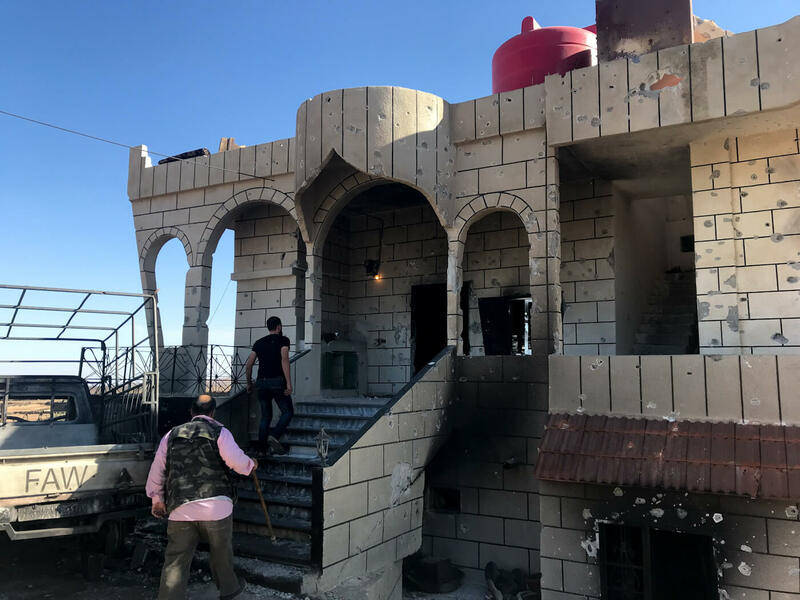 He told us that his family and other civilians were rounded up and taken to what is known as the “Bedouin House” at the outskirts of the village. The house faces in the direction of the eastern desert plains that divide Shbeki from the U.S.’ Al Tanf military base. The ISIS terrorists took all the men outside and executed them in cold blood. Among them were Hazem’s father, brothers, cousin and neighbor. The women and children were then forced outside to see the bodies of their fathers, sons and husbands before they were taken hostage and force-marched towards Tilal Al-Safa. 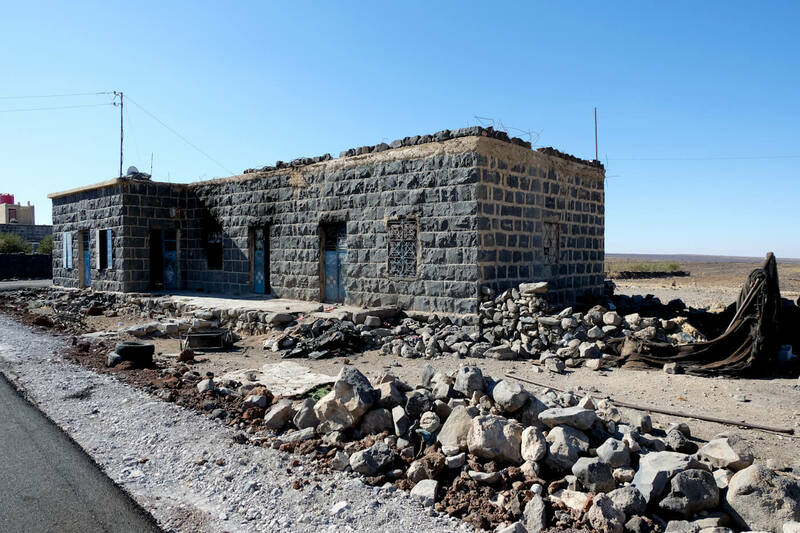 A few of those who had been kidnapped managed to evade their ISIS captors and returned to Shbeki, where they slept in an abandoned house just outside the village until dawn, when they were able to ascertain that the village was still under control of their friends and family. Among those who escaped were Hazem’s mother and sister-in-law. In total, 29 hostages were eventually abducted by ISIS mercenaries. 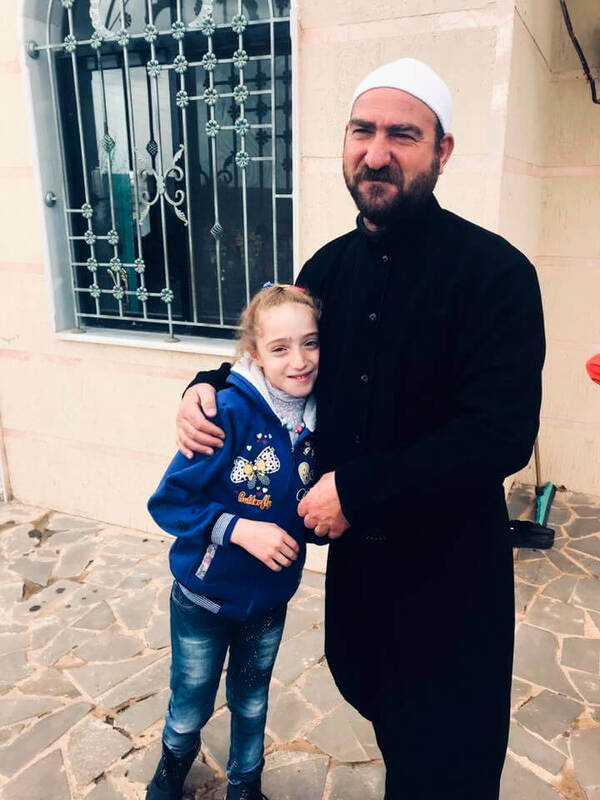 During the forced-march towards Tila Al-Safa, Hazem’s uncle’s wife, Ghosun Hasan Abo Ammar, had collapsed and had been unable to walk any further. 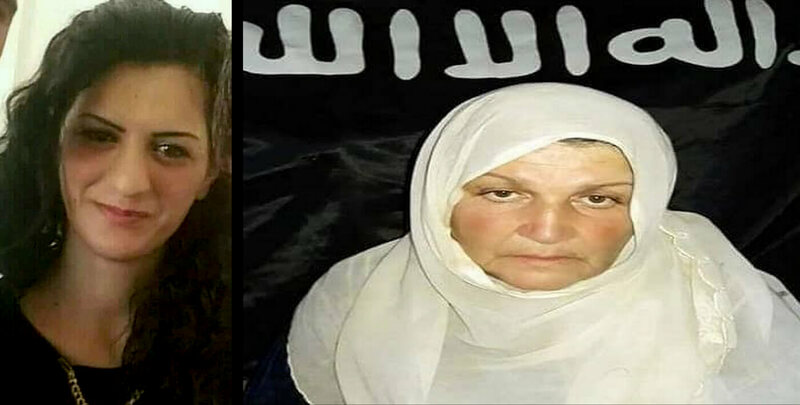 The first group of ISIS fighters left her by the side of the road and refused permission for anyone to stay with her. Later, I was told that another team of ISIS terrorists had followed on behind and had executed her on the road. Her body was eventually retrieved, the next day, 6 km from the village. Eight days after the attack, ISIS executed one of the few young men in the group of hostages. Twenty-year-old university student Mohannad Thokan Abo Ammar was brutally beheaded by ISIS according to his family in Shbeki. On October 2, shortly after I left Syria, ISIS executed Tharwat Fazel Abo Ammar. They shot her in the head and filmed the gruesome ending of a young mother’s life to taunt the Sweida civilians and to warn them of further executions if any attempt was made by the SAA to pursue ISIS. Threats were issued by ISIS to conduct further executions if the SAA did not throttle back its military campaign to eradicate ISIS in the Yarmouk Basin, vindicating a theory by H. Saab that this was one of ISIS’ motives behind the attack. Marwa Essam Al-Abazah was the wife of Majdee Abo Ammar, they had married just five months prior. Al-Abazah was the second female hostage to be executed by ISIS. Almost immediately after ISIS carried out the attacks in Sweida City and the eastern villages, the Syrian Arab Army (SAA) ramped up its operations to finally defeat ISIS in the region and to liberate the Sweida kidnap victims, who had been taken deep into ISIS-controlled territory in the volcanic and treacherous terrain of Tilal Al-Safa. On October 14, 2018, Syrian Arab News Agency (SANA) reported that units of the SAA, in cooperation with allied forces, were continuing to “tighten the noose” around ISIS terrorists in the depths of the rocky escarpments and cliffs of Tilal Al-Safa, the “last stronghold for ISIS in the Sweida eastern Badiya [desert].” The SAA was inexorably advancing, uncovering stockpiles of U.S.- and EU-supplied weapons and ammunition left behind by the retreating terrorists. Earlier in November, images taken from the mobile phone of a captured ISIS fighter had shown that the “terrorist group was using U.S.-made assault rifles and a Chinese-made man-portable air-defense (MANPAD) system, FN-6, which had been reportedly supplied with help from the U.S. and Qatar to several Free Syrian Army (FSA) groups in Syria.” The supply pipeline was the failed U.S. “train and equip” program authorized by former U.S. President Barack Obama in 2014 and halted by President Donald Trump in 2017. On October 20, following negotiations between the Syrian government and ISIS terrorists, six of the hostages were released. Among them were four children — Ya’arub Jba’ai, Mulham Jiba’ai, Ghaida Jba’ai and Amwaj Jba’ai — and two women — Abeer Shaglin and Rasmyia Abu Ammar — according to the SANA report. While certain corporate media outlets and “opposition” figures like Lebanese Druze leader Walid Jumblatt appeared to exploit the post-ISIS-attack confusion to attempt to drive a wedge between the Druze community and the Syrian government, all civilians I spoke to expressed gratitude for the way in which Syrian President Bashar Al Assad involved himself in the negotiations for the release of the hostages and for the government’s near-daily contact with community leaders to follow up on the progress of the talks. Their admiration and respect extends to the SAA, which fought a long and arduous campaign to cleanse ISIS from the southern region. On November 8, 2018, the news finally broke that the SAA had succeeded in liberating the Sweida hostages and had defeated ISIS in Tilal Al-Safa. After what was described by field commanders as an intricate and complex rescue operation, complicated by the ISIS fighters constantly moving the hostages to avoid detection, the surviving hostages returned to emotional and jubilant scenes in Shbeki on November 9. “Mob justice and revenge are no answer to ISIS atrocities,’ said Fakih. ‘Without a commitment to justice for violations by all sides, it will be difficult to deter more abuses.’” (emphasis added). Among the international community, Russia’s foreign minister was one of the very few that condemned the hideous slaughter of civilians in Sweida. The silence from other world leaders and media outlets was an appalling example of their priorities in Syria, which clearly do not include the Syrian people. UN Secretary-General António Guterres did unequivocally express horror at the ISIS attacks on the same day that they happened, but later statements by UN agencies distorted the view on who must take responsibility. The Office of the UN High Commissioner for Human Rights placed blame on the Syrian government, claiming that groups of ISIS terrorists included many “who were recently evacuated and relocated from the Palestinian Yarmouk Refugee Camp, Hajar Al Aswad and Al Tadamon areas of Southern Damascus as part of a [Syrian] government reconciliation agreement,” according to OHCHR spokeswoman Ravina Shamdasani. The Syrian government has been fighting off a terrorist invasion of their country for eight years — an invasion financed, equipped and armed by the U.S. coalition and its allies in Turkey, Jordan, Saudi Arabia, Qatar and Israel. The “placing of armed groups in the proximity of civilians” is entirely the responsibility of the U.S. and its allies and with its statement, the UN demonstrated the extent to which it acts as an outpost for U.S. Empire, supporting U.S. hegemony and globalism in the region. Jon Snow: Alison, I’m pretty sure we did report it on Channel 4 News… I will try to track it down… thanks for drawing my attention. Alison Banville: Further to your reply to me below regarding the horrific Sweida massacre in Syria in which you said you ‘think’ Channel 4 News covered it but you’ll check, there still appears to be nothing about it on the Channel 4 News website. Below is journalist Vanessa Beeley’s report from on the ground in the villages attacked by ISIS and the shocking testimony of witnesses. Isn’t this what Channel 4 News should have done if journalism is what you do? These are people begging for their voices to be heard. How can you justify not reporting this? Towards the end of November, I headed back to Shbeki to meet with the liberated hostages and their families. It was a cold and foggy day but the familiar warmth of the welcome I received dispelled any gloominess that might otherwise have pervaded the meeting, with the kidnap victims clearly reliving the trauma of the three months they had spent at the mercy of their ISIS captors. Jawdat sat next to the photo of his son, Qussai, a proud and dignified man but visibly shaken by the events of the last four months. He went on to describe how President Assad had made the liberation of the abductees a priority. Jawdat explained to me that many of the men of the village had been working in the Gulf states when the attack took place. It was five days before they could return home to the tragedy that awaited them. Jawdat’s brother’s family were also among the kidnap victims. Jawdat’s other son, Qais, had managed to escape his ISIS captors early on in the abduction and had returned safely home. Fadia’s testimony was an emotional journey through loss and trauma. She sat closer to the photo of Qussai and wept many times as she talked to me about the three months of ISIS brutality and abuse they endured. 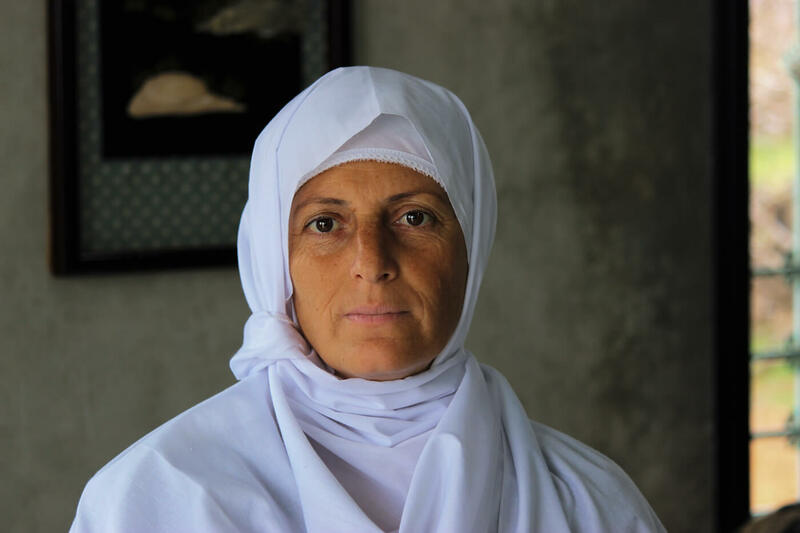 When the attack began, Fadia had gathered her three children around her — Shahed, Qussai and Qais. 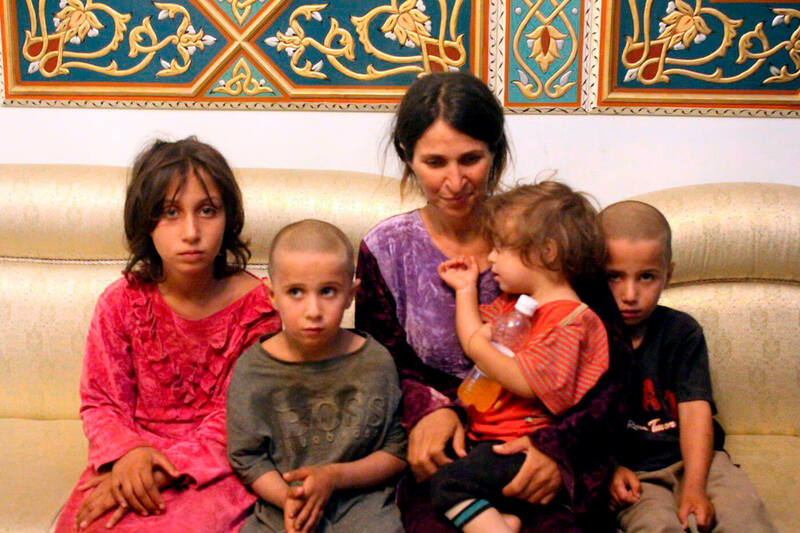 They had stayed hidden in their home but ISIS knocked on their door demanding that the men be sent outside. Fadia had remained silent but she described how shots were fired at the house to drive them out. Fadia told me how the terrorists would go to a house and drag civilians onto the street, these civilians would be forced, at gunpoint, to knock at a neighbors house to entice them outside. As the SAA advanced, ISIS would move the hostages deeper into the desert. At one point, Fadia told me they were marching for six days straight. The hostages were given one glass of water per day to be shared among three people and two dates for each hostage. For three days, they were given nothing. When the gunfire drew closer, the terrorists would taunt the children and the mothers by saying they would take the children towards the SAA positions and dig a grave for them so when they were shot, they would fall into the grave. Fadia tried to reassure her young son. The SAA soldiers approached the truck and told the hostages they were safe. Fadia begged one of the soldiers to please take care of her son, Qussai. Shortly after, an ambulance arrived and Qussai was given emergency treatment for his injuries. Soad Adib Abo Ammar is the mother of four-year-old Lamis and twelve-year-old Mirnah, who were also taken hostage by ISIS. 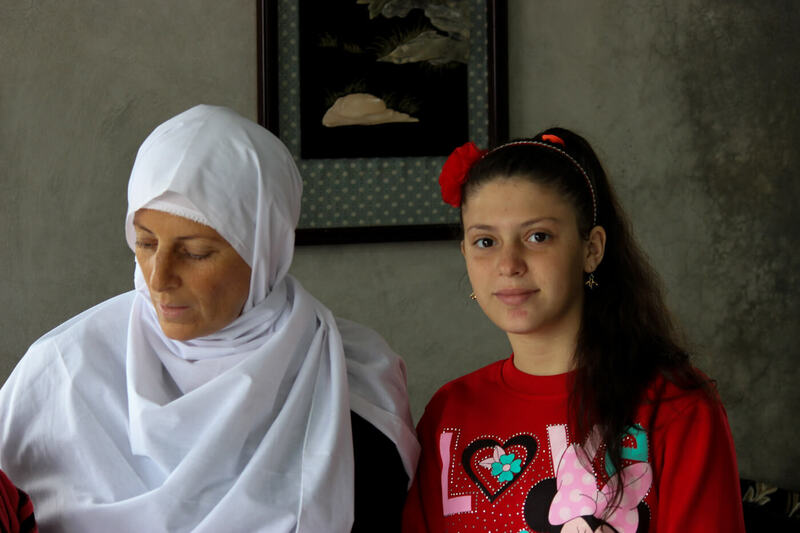 Soad’s daughter Mirnah told me that she had promised Qussai that she would not go back to school without him. Mirnah sat next to Qussai’s photograph and shyly told me how much she missed him and wished he had returned with her to Shbeki. Soad’s other daughter, four-year-old Lamis, was probably the most visibly affected by the three months of ISIS captivity. 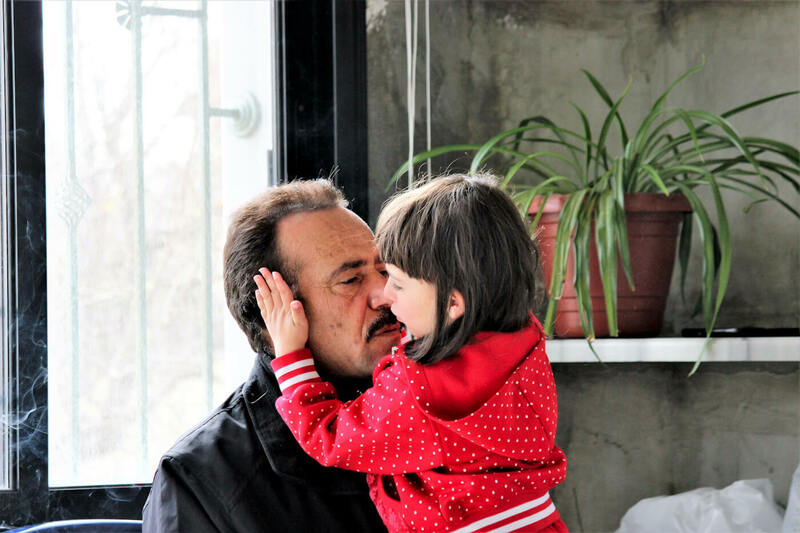 She clung to her father, Hikmat Abo Ammar, and initially refused to maintain eye contact. She wore a pair of red, plastic sunglasses that she was clearly hiding behind. She nestled her head into her father’s neck and would turn away if I approached her. Gradually she relaxed and joined some of the other children playing on the steps outside the Madafa, but the need to feel the reassurance of her father’s arms around her would pull her back inside and to her father. In the following video an SAA soldier scoops a traumatized Lamis up into his arms and asks her if she wants to go home to Sweida on the day of their liberation from ISIS. Then we see Lamis with her father in the Madafa in Shbeki on the day I interviewed the liberated hostages. Like so many of the other husbands and fathers, Hikmat was working in Saudi Arabia on the day of the attack and was unable to return for five long days. He also described the haunting and devastating tragedy that he was met with upon his return, the long wait for news of his wife and daughters and their eventual return. Hikmat also wanted to ask people in the West to force their governments to stop financing terrorism in Syria. Hikmat told me that for the duration of the captivity of his wife and children, he couldn’t bring himself to enter their family home. The residents of Shrehi and Shbeki and the five other villages attacked by ISIS on the 25th of July, 2018 have shown extraordinary resilience and fortitude. The dignity of the women I spoke to shone through the trauma they had been forced to experience and the losses they had suffered. The pride in the resistance of a handful of inexperienced local fighters who fought off an attack by a well-equipped, battle-hardened gang of terrorist criminals was expressed by all with whom I spoke. The Syrian people know who is responsible for their suffering and they have pleaded with us to do something about it. We owe it to four-year-old Lamis, the child martyrs Qussai and Raafat and an entire generation of war-traumatized children across Syria to respond to their call for action.